RENT MATTERS – WHAT PROTECTIONS AND PRACTICES NEED TO BE IN PLACE TO STABILIZE TENANCIES? One of California’s most serious challenges to a viable economic and socially dynamic future is the severe shortage of affordable housing, especially affordable rentals. While this need is most acute among low-income workers, all workers are increasingly challenged to find appropriate affordable rental housing. These are the workers we all rely upon to help us with housework, yard work, care of our elderly, service in restaurants and shops, help in our library and schools. And many workers are moving to lower housing cost states. Those who do not have the option or resources to relocate are increasingly faced with homelessness. Our communities need to meet the housing needs of people of all incomes. 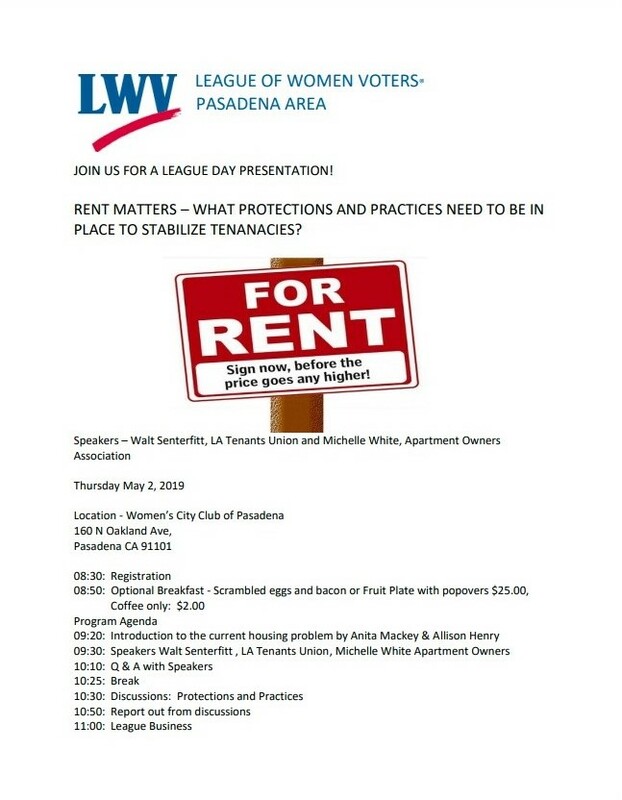 Join us on League Day to gain an understanding of the challenges facing both tenants and landlords as we seek to find a fair balance between their respective rights and responsibilities.